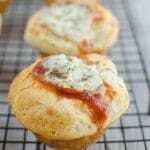 Pizza Muffins – only 5 ingredients! 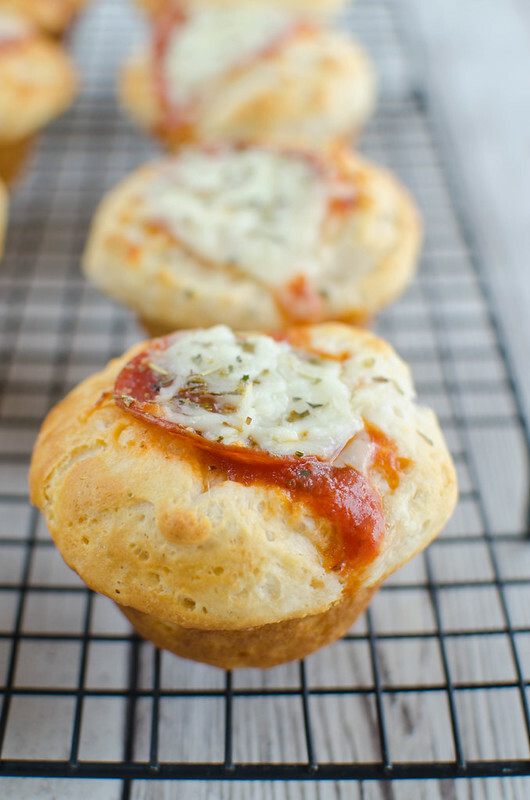 Canned biscuits pressed into a muffin tin and filled with pizza sauce, pepperoni, and cheese! Kids love these! You guys, it’s all I had time for this week. Plus, I know ya’ll love a quick and easy recipe every once in a while. Five ingredients, nothing to prepare in advance, and kids love them. So how was the week? We had another busy one because of the move. We were back and forth a lot and I had to get power and water and I still haven’t had time to get a mailbox but that’s number 1 on the list for tomorrow. And it’s stupid cold in Texas again and I just don’t want to go anywhere or do anything because I am not made to function in cold climates. Freezing rain this morning, guys. Truly don’t know how I survived in Colorado for 4 years. The kids had their first day at the new school this week and it went amazingly well. My oldest 2 both got lockers and if you can remember how excited you were the first time you got a locker, you know this is a big deal. And the school has been incredible and everyone is so nice and I’m just really happy that things have fallen into place like they have. Not so fun? School supplies for the 2nd time this year. Admittedly, I did kind of just show up at their old school a week before I told them I was going to pull them out so none of their supplies were packed but man, buying supplies again hurts. Anyway, now that they are all settled in their new school, I have my days free again and I need to know where the good hiking trails are around here. Someone help me! I’m used to going to Harker Heights or all the way to Georgetown but I know there have to be some decent ones in the Belton/Temple area. We’re all the way unpacked now at least, even if the Christmas stuff still hasn’t found it’s way to the attic, all my blog props are living in the linen closet with the beach towels and I’m using boyfriend’s rolling desk chair to hold up my reflector for all my photos. This was our first weekend in the house so we had to get doughnuts from Daylight Doughnuts in Belton on Saturday morning. It’s definitely a chain but I was talking to the girl working there about the bacon doughnuts (they had maple bacon and chocolate bacon) and she was annoyed at how light the chocolate glaze had turned out and it just had the feel of a smalltown doughnut shop that wasn’t cranking out perfect doughnuts all day long. Which is exactly what I look for in a doughnut place. Also? 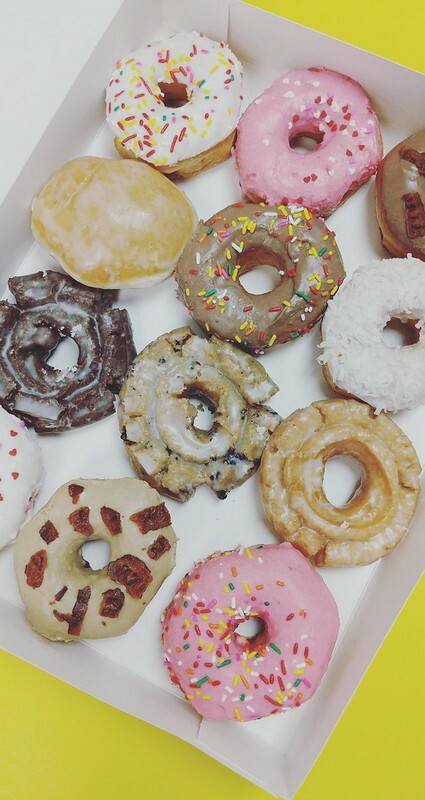 The doughnuts were delicious. I had the pink heart one, duh. The first thing I baked in the new house was an amazing 4 layer sprinkle cake with cream cheese frosting from the New York Times. I doubled the cake part and did it in 4 pans and then kept the frosting pretty much the same and still ended up with a pyrex full of it in the fridge. 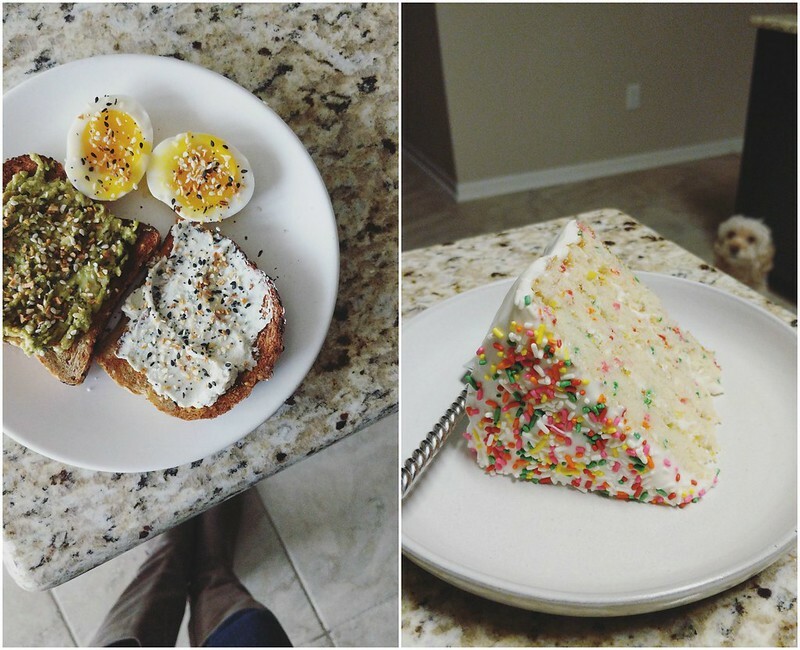 Currently obsessed with 6 minute eggs and Kite Hill Chive Cream Cheese on toast for every meal. Oh, and Trader Joe’s Everything But The Bagel seasoning because duh. Any moms Belton/Temple up for being my new Trader Joe’s carpool buddy? Binge listening to the Dirty John podcast and it’s not my favorite but it’s good background noise and when you’ve listened to all the other true crime podcasts, you settle for what you can get. Also still listening to Food Freedom Forever and I started Wild by Cheryl Strayed for when I get tired of listening to food talk. OH! Celebrity Big Brother! I am watching but I’ve only seen the 1st episode and I’ll catch up tonight but I’m really just excited for Survivor season. On my nails: OPI Hello Hawaii Ya? and you can see it on my Instagram and you should also follow me over there because I’m posting more on Stories than anywhere else these days. 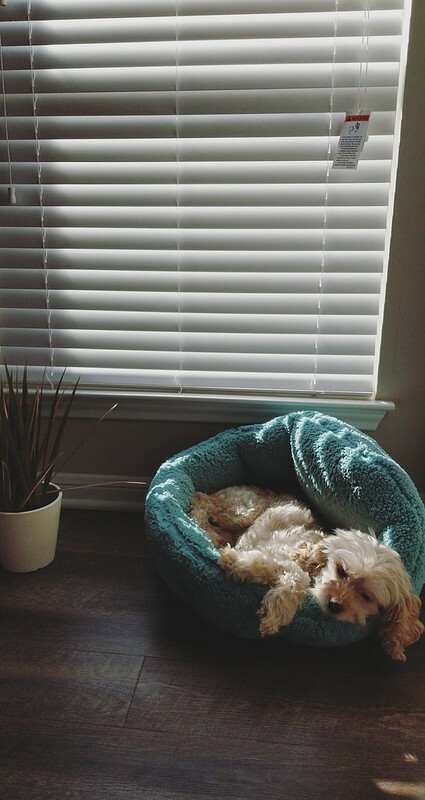 Clementine got this bed for Christmas and it’s orthopedic and self-warming and she’s never been happier. 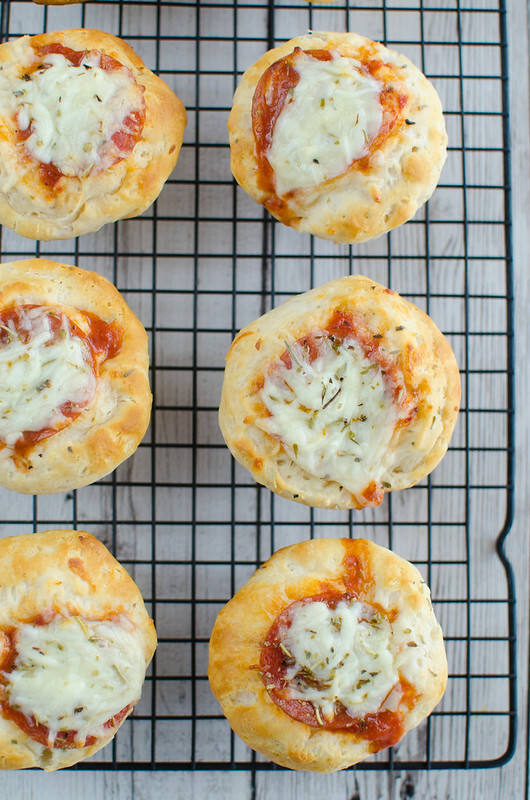 Like I said, these Pizza Muffins are super simple, like so simple my 10 year old could do it himself. It’s just canned biscuits pressed into a muffin tin and filled with pizza sauce, pepperoni (or you can totally do cooked sausage, ham, whatever), and cheese. And then some Italian seasoning on top to make the house smell like a pizzeria. 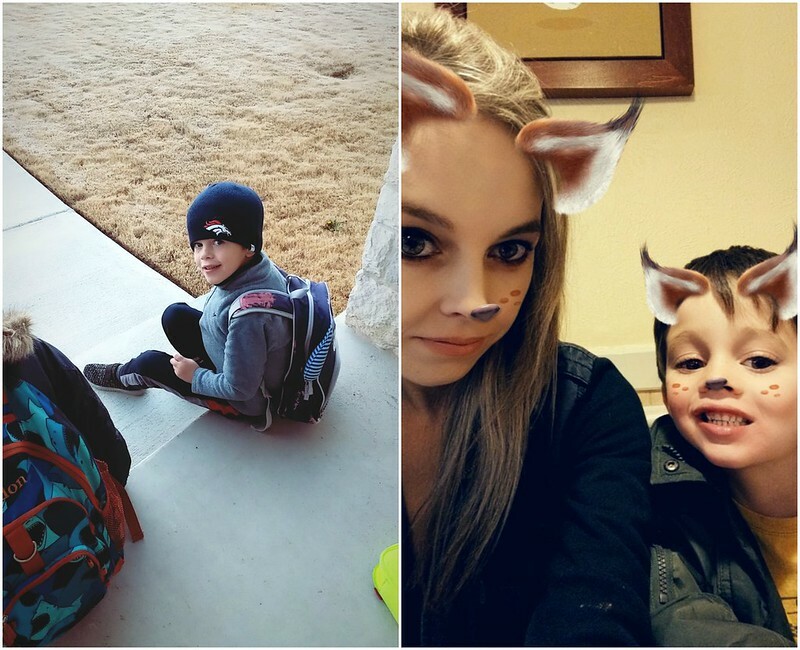 The recipes make 8 (if you use the regular Pillsbury biscuits) and my 3 boys ate all of them so you may want to double up on the recipe if you’re feeding more than 3 small children. Preheat oven to 425. Spray 8 muffin cups with oil. Flatten each biscuit slightly, making sure it's large enough to fill the muffin cup. Press each one into a muffin cup. Fill each biscuit with about 1 tablespoon of pizza sauce, 1 slice of pepperoni, and 1 tablespoon of mozzarella cheese. Sprinkle Italian seasoning on top. Bake 10 - 12 minutes or until golden brown. Cool slightly before popping out and enjoying.